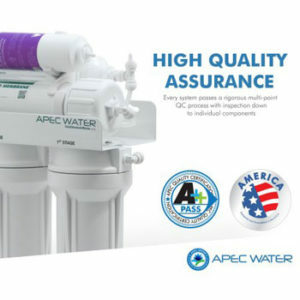 The APEC Top Tier 6 Step reverse osmosis system is one of the most advanced water filters you can buy at a decent price. This model is small enough to fit under a standard kitchen counter, and anyone used to doing things around the house will be able to install it in about one hour. In the following article, we review the pros and cons of using this filtration system, and we also examine its efficiency. 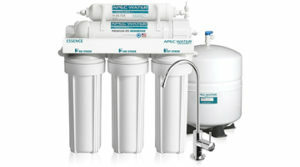 This RO system uses a six-step filtration process. The whole process consumes 3 gallons of wastewater for every gallon of filtered water. This might not seem very efficient at a first glance, but it’s actually a lot better than what other models are capable of. Reverse osmosis systems are considered efficient if they have a wastewater pure water ratio of 4:1, so with a 3:1 ratio, this unit fits into the top category. One of the advantages of using this reverse osmosis model is that the sixth filtration step actually adds minerals to the water. These minerals are very important for your health, but unfortunately, most reverse osmosis filters eliminate them from the water source. Besides being good for your health, the added calcium carbonate will also improve the water’s taste. Reverse osmosis filtering systems are considered efficient if they have a wastewater pure water ratio smaller or equal to 4:1. With an efficiency ratio of 3:1, this model is considered very efficient. Having a highly efficient filtering system will actually save you money in the long run because your water consumption will be smaller. This model has a tank capacity of 4 gallons, but only 3.2 gallons of pure water will actually be stored in it. The rest of the volume is for the pressure bladder. This reverse osmosis system uses a six-step filtration process. This means that the water will pass through 6 different filters before being pure. The filters are easy to replace, and you can easily find replacements online. The first three filters should be changed after 6 months to one year of use, depending on the water’s quality. 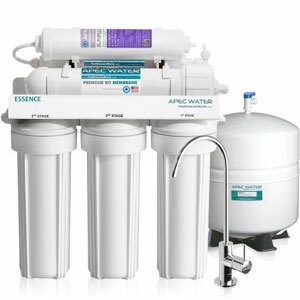 The fourth filter is actually the reverse osmosis membrane, and you should change it only once every 2 or 3 years. The fifth filter is the carbon one, which should also be changed after 2 or 3 years. The sixth filter is actually the water neutralizer which adds calcium carbonate to the water. This filter can be changed every 4-6 years, depending on your water source. These filters are very good at purifying the water. They are capable of removing up to 99% of the impurities found in your water source, including fluoride, chromium, lead, copper, cadmium, barium, arsenic, radium, and more. Installing the APEC Top Tier 6 Step is a piece of cake. The filtering system comes with everything you’ll need for the installation, but you should also keep an adjustable wrench, a screwdriver, and a drill close at hand. The installation manual this model comes with is very thorough and detailed, so you will be able to follow its instructions with ease. If you like to watch an instructional video better, there are some tutorials you can watch on Youtube. Keep in mind that the installation is not very difficult, but it’s much easier when you have another person to help. You should also be careful when manipulating the adapter during the installation. The adapter edges are sharp, and you can injure yourself by accident. The Teflon tape provided by the manufacturer should be used to prevent leaks. Once the system is fully assembled and installed, empty at least 5 tanks of water before tasting it. This will allow the filters to activate properly, especially the last one which will add calcium carbonate to the water. Great Taste – It might not seem like much at a first glance, but having the sixth filter really pays off. The calcium carbonate it adds to the water will also improve the water’s taste. Efficient – This model is capable of producing a gallon of pure water wasting only 3 gallons of wastewater. This makes it very efficient, so it will save you money in the long run. Good Instructions – Both the instruction manual and the video tutorials are very helpful, so anyone will be able to install the unit if they follow them. Installation Is Easier In 2 – While installing this unit is not very difficult, you should have someone to help you if you want to complete the job quicker. If nobody’s helping you, the constant changes in position can be frustrating.